NFF Visits Darwin for School Presentations! On Monday 26th September, Kate and Julie arrived in Darwin for 4 days of school presentations at local Darwin High Schools. It was their first trip interstate to deliver Travel Safety Presentations at High Schools where Kate spoke to Year 12 at Darwin High, Year 12 at Essington College and to Year’s 9 – 12 at Taminmin College in Humpty Doo. The lasting impact she left behind was incredible, “Kate’s talk has generated a lot of discussion around the school! I’ve been teaching for 7 years and have sat through a lot of talks and have never seen one make as big an impression on the students, so keep it up!“, is the feedback from Rob McIntosh, a Taminmin College PDHPE teacher. This interstate trip was initially originated by Mr McIntosh and his Year 9 Pastoral Care class at Taminmin College, a large rural high school in Humpty Doo – about 30 minutes from Darwin. 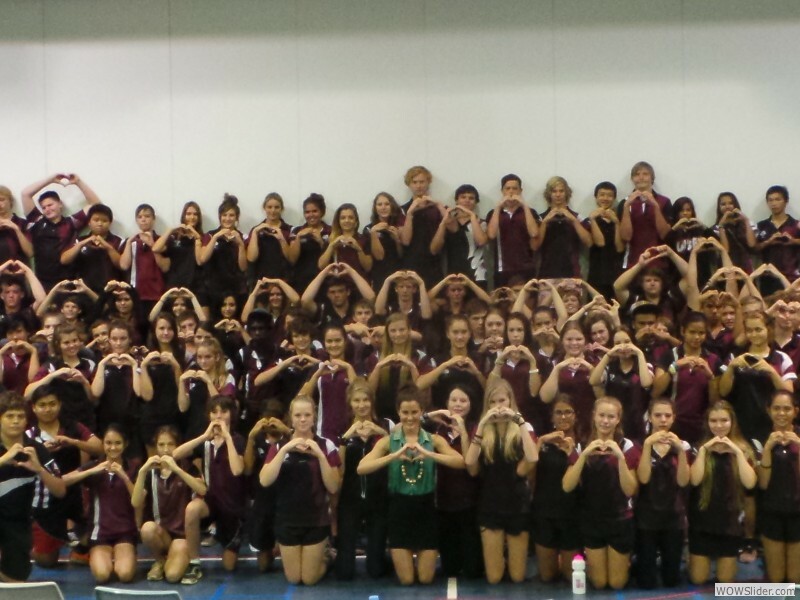 Each year they run the Taminmin Cares Challenge, where each year 9 Pastoral Care group raises money for a charity and Year 9B selected the Nicole Fitzsimons Foundation as their charity this year. Their students were compelled to work for Kate, not only due to her courage and the inspiring way she is attempting to prevent avoidable overseas fatalaties/injuries but also because the destinations she talks about are so close to those in the NT. Most of NT kids go to Bali for schoolies or just a trip with family or friends, yet they are not aware of the potential risks that they may face abroad. Taminmin’s students want to promote worthwhile causes like this in the Territory. Kate and Julie had one of the most amazing experiences sharing Nicole’s legacy and the important travel safety messages that tragically come along with it to many wonderful NT students who whole heartedly embraced the lessons Kate teaches through her presentations. Wow. This past week up in Darwin delivering my first interstate travel safety school presentations was easily one of the most humbling and rewarding experiences in my life. It was very surreal to be delivering my presentations on the other side of Australia within the first year since losing my beautiful sister and the powerful impact I had with the students was overwhelming uplifting. Hearing that majority of students I spoke with had booked schoolies or had upcoming holidays in Bali made me so grateful that I had the opportunity to share Nicole’s story with them all to serve as an unforgettable warning that we need to keep our safety as a priority with every decision with make wherever we are in the world. Taminmin College was the 25th school I delivered my presentation too and I can’t believe I have hit a quarter of a century in my school visits! I couldn’t think of a more special school to hit this milestone with than this wonderful college in Humpty Doo who were the ones who originally invited me to Darwin & helped make this trip happen!